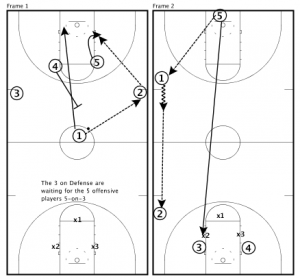 I found this drill on FastModel Sports Basketball Plays and Drills Library. They have several pages with drills and plays posted by high school and college coaches. 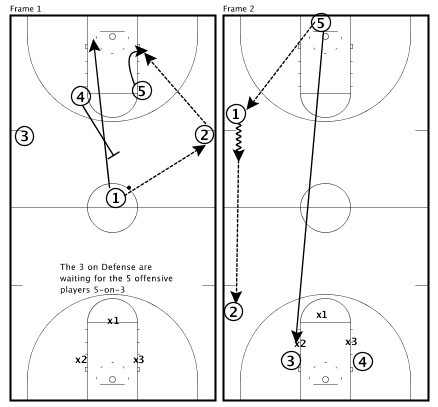 This is a way to get some variety in your drills as you work on 5/0 offense and on your transition game. 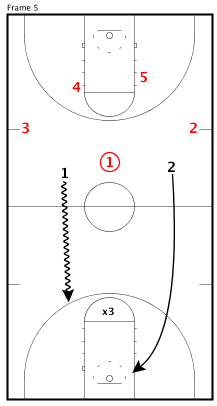 This 5-3-2-1 Push-Push Drill from Gary Colson can be used to practice running your fast break after a made basket. Run offense against no defense. When offense scores 5 takes it and passes it to 1 going down the sideline. 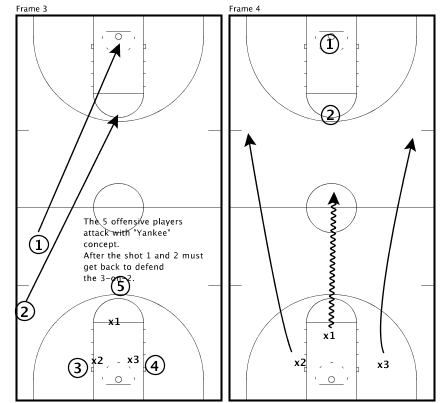 Run your secondary break into a 5 on 3 situation. 5-on-3 until they score or the defense gets the ball on a steal or rebound. They will attack 3 on 2 which will be our 1 and 2 who transitioned back on defense. 3-on-2 and whoever shoots first is back on defense vs 1 and 2. We finish the (5-3-2-1) with 2-on-1.